Chinese action star Jackie Chan has appeared hawking a number of things in his life. He's even had a very popular children's cartoon show named after himself. This cartoon even spawn a video game—but today, we're here to talk about one of the lesser known Jackie Chan titles, Jackie Chan Martial Arts Legend. Chan, who is no stranger to product placement, has appeared in advertisements for various products across China, Taiwan, Hong Kong and Macau, some of which were video games related. However, this time around, Chan has lent his image to a free-to-play online Facebook game. Keep in mind that this game isn't new, it's just obscure! Developed by the Beijing-based folks at 6Waves, Jackie Chan Martial Arts Legends is pretty much what one would expect from a social game. There's farming, bothering friends for items and upgrades, limited energy to do things, and of course the eventual pay wall of in-game micro transactions. Think of this as Farmville but with Jackie Chan's face and name plastered all over. The goal of the game is to build a martial arts dojo, train your own character, train students, and eventually become a "martial arts legend". 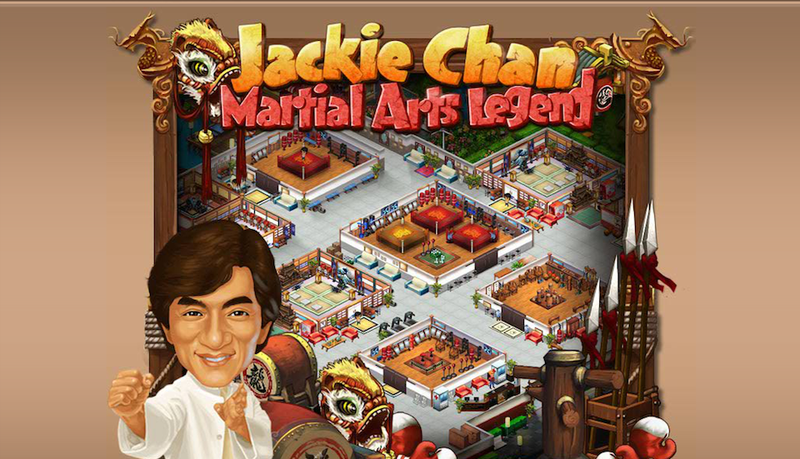 All along the game, the player can visit other dojos, even Jackie Chan's dojo. I'm mixing up martial arts terms on purpose, as the game doesn't only adhere to one form of martial art, and it includes multiple different types. To shake the Farmville formula up a bit, the folks at 6Waves included a battle element. Basically, it is a Pokémon-style turn based battle system where players can duke it out against computers. There isn't much else to say about this game apart from that it's interesting to see that in his old age, Jackie Chan is still a master of marketing. Investing in a Facebook game to keep himself relatively relevant. Oh wait... I thought Facebook was on its way out. I wonder what Chan's face will appear in next?